Retinoblastoma is a cancerous tumor that grows in the retina, a layer of nerve tissue in the back of the eye that senses light and sends images to the brain. The organ affected by retinoblastoma is the retina. One or both eyes may be affected. The pupil of the eye may appear white or have white spots. A white glow in the eye is often seen in photographs taken with a flash. Instead of the typical "red eye" from the flash, the pupil may appear white or distorted. If the cancer has spread, bone pain and other symptoms may occur. The cancer most often affects children younger than 6 years old. It is most commonly diagnosed in children 1 to 2 years old. Retinoblastoma is caused by a mutation in a gene that controls how cells divide. As a result, cells grow out of control and become cancerous. In about half the cases, this mutation develops in a child whose family has never had eye cancer. In other cases, the mutation occurs in several family members. If the mutation runs in the family, there is a 50% chance that an affected person's children will also have the mutation. These children will therefore have a high risk of developing retinoblastoma themselves. If the cancer has not spread beyond the eye, almost all people can be cured. A cure, however, may require aggressive treatment and even removal of the eye in order to be successful. If the cancer has spread beyond the eye, the likelihood of a cure is lower and depends on how the tumor has spread. Blindness can occur in the affected eye. The tumor can spread to the eye socket through the optic nerve. It may also spread to the brain, lungs, and bones. If retinoblastoma is suspected, the doctor will refer your child to a pediatric ophthalmologist, an eye doctor who will examine the retina by dilating the eye, sometimes under general anesthesia. He or she might also order imaging tests, like an ultrasound of the eye, a computerized tomography (CT) scan, or magnetic resonance imaging (MRI), as well as blood tests. If retinoblastoma is diagnosed, a pediatric oncologist (cancer doctor) will test to see if cancer is anywhere else in the child's body. He or she might perform blood tests, a spinal tap, or bone marrow biopsy. Live tissue samples, or biopsies, are rarely used to diagnose retinoblastoma because they can cause cancer cells to spread beyond the eye. A pediatric ophthalmologist, pediatric oncologist, and radiation therapist will work together to treat a child with retinoblastoma. This team will individualize a plan for each patient based on the extent of the disease within the eye, whether it is in one or both eyes, and whether it has spread beyond the eye. Chemotherapy: Tumor-killing medications are given orally, through injection or intravenously (in a vein). Intra-arterial chemotherapy: In some cases, doctors are now injecting chemotherapy drugs into the blood vessel that feeds the eye to get the medication to the tumor more directly. External beam radiation: Beams of radiation are carefully focused onto the tumor to kill cancer cells. Brachytherapy: Radioactive material (little rods or pellets) is placed within the tumor to deliver beams of radiation to specific areas. This form of treatment minimizes the damage to surrounding healthy tissue. Radioactive plaques: A disk is implanted in the eye with a dose of radiation applied directly to the tumor site. Cryotherapy: Liquid nitrogen or argon gases ― two extremely cold substances ― are used to freeze and destroy diseased tissue. Transpupillary thermotherapy: Laser energy (through the use of infrared light) heats up cancer cells and surrounding blood vessels, which kills the cells. Photocoagulation: Laser energy is delivered to blood vessels surrounding the tumor, causing blood clots and depriving the cancer cells of nutrients. 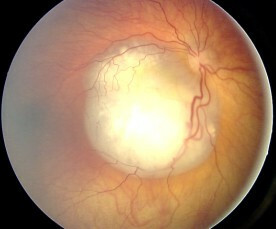 Enucleation: In severe cases of retinoblastoma, the entire eyeball is removed to prevent the spread of cancerous cells to other areas of the body. During treatment for retinoblastoma, a child will need periodic examinations of the eyes (usually under anesthesia) to confirm the effectiveness of treatment. © 2019 Pro Visu Foundation. All Rights Reserved.